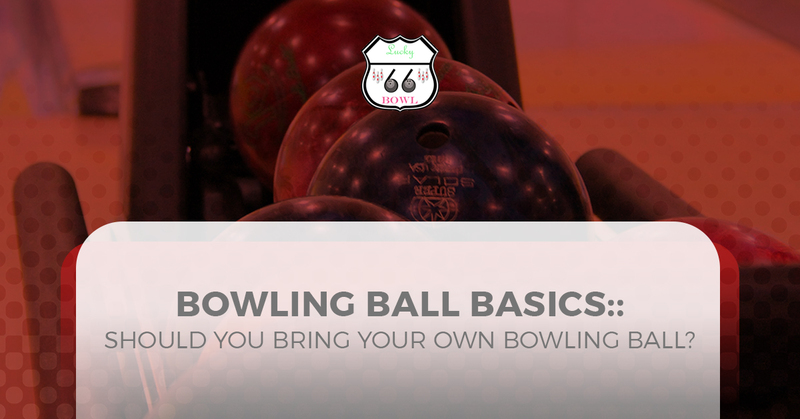 Bowling Ball Basics: Should You Bring Your Own Bowling Ball? At Lucky66 Bowl, we see a wide range of bowlers. From casual bowlers who rely on the bumpers to bowl a decent game to the semi-pros who throw a mean hook and just about everyone in between, our bowling alley in Albuquerque has pretty much seen it all — with the exception of seeing the infamous Big Lebowski himself. This range of bowlers also presents a variety of bowling equipment. While we’re happy to rent out things like bowling shoes and house bowling balls (included in the cost of your games, of course), plenty of serious bowlers bring in their own gear — particularly, their own bowling ball. Lucky66 Bowl Is As Passionate About Bowling As You Are! Is it worth purchasing your own bowling ball? Of course, that depends on how serious you are about bowling. If you really do want to get your own ball, what are some of the considerations and aspects of bowling balls to keep in mind? That’s the subject that our Albuquerque bowling alley is going to strike in today’s blog post. We’d spare you the details, but for those who are curious, this is important information! As always, if you’d like to learn more about the best bowling in Albuquerque, you’re curious about joining a bowling league, playing sand volleyball, you’d like to rent out one of our banquet halls, or you just have questions for Lucky66 Bowl, we’re happy to help you out! Contact Albuquerque’s best bowling center today. Why Use Your Own Ball? In short: To raise your average. Consistency is the key to raising your average, and using your very own ball helps. From factors like the size of the holes to the ball’s overall condition and the materials used to make the ball, it’s fair to say that not all bowling balls are created equal. If the ball doesn’t fit your throwing hand very well, you’re just not going to perform well. These are facts. House bowling balls, or ones that you’d find racked up at a bowling alley, are generally more durable but less comfortable, intended to be used (and abused) frequently. A performance ball, on the other hand, is only used as often as you personally use it. A custom ball uses finger holes that are drilled specifically for your own hand, ensuring a perfect fit that’s not only comfortable but also helps improve your accuracy and thus, your consistency. It’s all about that smooth release and follow through. We’re not going to get too deep into the dynamics of hooking a bowling ball (perhaps our bowling lanes in Albuquerque will save that for a future blog post). The main takeaway is that house balls aren’t designed to hook. A performance ball, however, is designed to hook. Performance balls are typically made of resin, which is less durable than house bowling balls, but is also designed for optimal spin and a smooth roll. Regardless Of Your Equipment, Come Visit Our Bowling Alley In Albuquerque Today! With competitive Albuquerque bowling leagues to pit your new performance bowling ball against other bowlers, and just-for-fun leagues to casually use our own well-maintained equipment, Lucky66 Bowl does it all! Discover more about the best bowling center in Albuquerque by contacting us today. Learn More About Joining a Bowling League Here!